A Wedding can be very emotional and at the same time stressful for every bride. Emotional and moral support is very much needed by the bride during her wedding and that’s why there are angels in the form of bridesmaids next to the bride in each wedding. Your bridesmaids are not only your best friends; they give you emotional to moral to physical support. There is no better way to show your appreciation for your bridesmaid’s time and efforts with beautiful bridesmaid gifts. 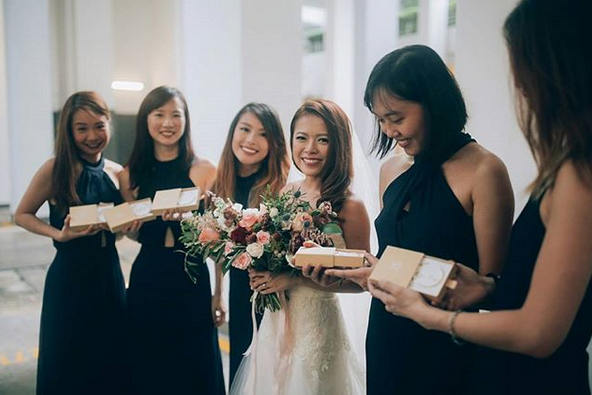 Here are some tips on how to choose bridesmaids’ gift with the proper cares and attention your dear girls deserve. A lot of brides do the mistake of choosing the same bridesmaid gift for all. What works for one person might not work for the other, so you should not stick to one gift for all bridesmaids. Don’t give the same gift to all the girls, give each bridesmaid a different gift, which should her personality. No matter how busy you are, your wedding planning won’t be just about yourself. Also shopping for bridesmaids’ gifts should be well-planned, special and unique, and should suit the personality of each of your bridesmaids. A bridesmaid’s gift is a symbol of your friendship and it will be the most meaningful thing you ever give to your closest friends. Get a gift that suits her personality, because every woman is different in her own way. Put some efforts and make them feel special. Personalized gifts will not only build up your friendship but also go on for years to come. Make sure your gift is multifunctional, re-wearable and re-usable. Choose a gift that is useful in the future, like wedding jewelry with a beautiful jewelry box or a fancy bridesmaid’s bag etc. 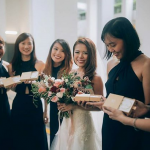 Bridesmaid gift shop Singapore has a huge range of options for you. This way, each bridesmaid will know that you took the time to pick out something special for her. You can gift your bridesmaids going out of the way like booking a table in a fancy restaurant or getting them tickets to a movie show etc. You can also book a spa treatment for them to relax after the stressful wedding, subscription service of flowers and cooking classes and more. Give them something that is gracious and pleasant. No matter what the gift is, don’t forget to add a thoughtful, handwritten thank you note and it can mean a great difference. With a personal message of appreciation, show them how much they mean to you.